Ernakulam district is one of those areas which receive huge prominence among all other places of Kerala. Especially for its tourist attractions, numerous country-renowned temples and for its trade relations with the rest of the world, people in large numbers visit the place round the year. Providing administrative support to this massive number of visitors along with the inhabitants of the district is a huge challenge which is met up in an excellent way by the administrative offices of Ernakulam as well as the Government of Kerala. The best of facilities, supreme network, efficient government offices, faster approach, quick resolutions and a well-structured environment is available at every corner of Ernakulam district. It is the joint effort of several administrative offices that today the people in Ernakulam enjoys best provisions with all necessary amenities right at the doorstep. For the betterment from the administrative point of view the state is divided into 14 revenue districts among which Ernakulam is one. Based on its geographical features, cultural significance and historical similarities, the district Ernakulam has been mapped with Central Kerala along with Idukki, Thrissur and Palakkad districts. These districts are again divided into revenue divisions, various Talukas and multiple revenue villages. Apart from this district Panchayat, Block Panchayat and Gram Panchayats are also there which look after the administrative requirements of several areas. Also there are Municipalities and Municipal Corporations with designated jurisdiction monitored by the Department of Urban Affairs which was formerly called Department of Municipalities. 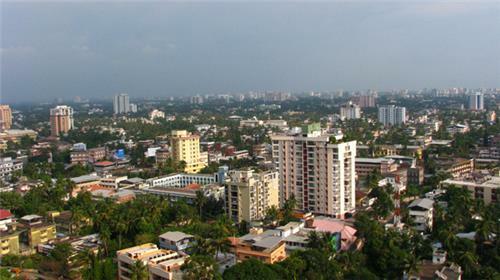 In Ernakulam, the district is divided into two revenue divisions Muvattupuzha and Fort Kochi. With this two, Ernakulam has the major number of talukas in the state under its umbrella which consists of Paravur, Aluva, Kunnathunad, Muvattupuzha, Kanayannur, Kochi and Kothamangalam. The Municipal Corporation for Ernakulam is Kochi which also forms the administrative headquarters for Ernakulam district. Apart from this there are several municipalities in Ernakulam district which includes north Paravur, Muvattupuzha, Perumbavoor, Aluva, Angamaly, Thripunithura, Kalamassery, Kothamangalam, Eloor, Maradu and Thrikkakara. Among several strong pillars in the administrative department of Ernakulam district, one of the major one is the Office of District Collector supported by Additional District Magistrate and other Deputy Collectors. Appointed by the State Government this is an officer of Indian Administrative Service. It is true that the administration is carried out by several government departments and its counter district level offices but the leader of district administration is the District Collector and the offices of the district level always seeks advice from the same. The officer in the position is known to enjoy huge powers and authority which is utilized for the betterment of the district as well as the state in turn. He is also entitled to keep the law and order maintained in the district. Another important office which is responsible for the betterment of district functioning is the Office of Tehsildar. The major responsibility of this office is related to revenue administration, maintaining records and files related to it and collecting government dues from the people as and when it remains applicable. The prominent Office of Tehsildar in Ernakulam are Kochi, Kanayannoor, Paravur, Aluva, Kunathunad, Muvattupuzha and Kothamangalam. Ernakulam is a district which posses tremendous scope for development. GCDA or Greater Cochin Development Authority, is responsible for some development in and around Kochi, which is an integral part of Ernakulam district. Ernakulam is monitored and protected in matters to law and order by the efficient Kerala Police. With strength of 42,149 police force they cater a consolidated population of 31.8 million people. This extremely efficient force is headed by the Director General of Police. The district Ernakulam falls under the jurisdiction of ADGP South Zone and subsequently, IG Ernakulam, who has CP Ernakulam City and SP Ernakulam Rural to look after the crime and law maintenance of the area. Restoring Peace and harmony and and making the district a socially habitable place with negligible crime rate is the main focus of the Ernakulam Police Administration. Apart from the usual police stations placed in every locality of the district with superb network the district also has specialised services like special branch, crime records bureau, administration, narcotic etc. The district is monitored by multiple police chowkis keeping a check on every activity in the area. The judicial administration of the district mainly falls under the wing of Ernakulam Court. Having a strong history in excellent judicial setup, this is one of the strongest administrative part of Ernakulam district. The major focus of this division is to maintain law and order by providing justice to the appealing authority. There are several courts in the district catering to multiple numbers of cases. There are criminal courts, civil courts, tribunal and special courts, and family court in Ernakulam. The courts are based in Ernakulam district are in N Paravur, Ernakulam, Aluva, Muvattupuzha,Kochi, Kolencherry and Perumbavoor and Kothamangalam. However, apart from this there are several other government departments which take active participation for the best interests of the district. Be it the offices of Income Tax, Post office, Social Welfare, Panchayat Office, Agricultural division and many others which have considerable contribution in making a better society in Ernakulam. An important part of Indian state Kerala is Ernakulam district. The prominence of Ernakulam has been for several causes like excellent tourism facilities, being the commercial capital of the state, forms immense opportunity for trade and commerce, excellent educational facility, cosmopolitan environment and many others. In fact, it has been declared as the district having highest footfalls of vacationers in the whole state. To facilitate the vacationers on different parameters the Government has uploaded specified websites to help the people know more on Ernakulam. These websites are an insight to various parts of the district, administrative features and other services provided by the Government. They give detail information on what is there and also the details on future projects and planning. These websites have contact information about respective departments and the detail address of their offices. Even the names of designated officers are also available here for reference. The below links are some of the important ones in the overall functioning of the district. Apart from the administrative offices there are various services provided by the Government for its inhabitants. Here is a list of the links to all those services.